3 Stocks We Like More Than Kinder Morgan Inc.
With the pipeline giant no longer offering an enticing dividend, there are better options available. With shares of energy infrastructure company Kinder Morgan (NYSE:KMI) yielding just 2.25%, it may be a good idea to look elsewhere. Here's why NRG Yield (NYSE:CWEN), Caesarstone (NASDAQ:CSTE), and AutoZone (NYSE:AZO) are better bets. Travis Hoium (NRG Yield): Kinder Morgan is supposed to be a cash-flow machine for investors, acting as a toll collector on thousands of miles of oil and gas pipelines. At the end of the day, the company should be judged by its cash flow and dividend -- which is no longer a great value at a 2.2% dividend yield. And it's why I think NRG Yield is a much better stock for dividend investors in the future. NRG Yield owns primarily renewable energy assets, like wind and solar power plants, that have long-term contracts to sell energy to utilities. Sixty-seven percent of the company's assets are wind or solar and they have an average of 17 years of life on their power-purchase agreements. The cash generation from the sale of electricity is then used to pay investors in the form of a dividend. Yieldcos are really that simple. And the yield for NRG Yield today is 5.7%, which is high enough to be an attractive yield for investors and low enough that the company can buy projects with new debt and equity, and have those projects be accretive to the dividend long term. If it's dividends you're looking for in energy, NRG Yield is better than Kinder Morgan, hands down. Tim Green (Caesarstone): The energy infrastructure business is pretty far removed from my circle of competence, so Kinder Morgan isn't really on my radar. One company that I do like is Caesarstone, a manufacturer of engineered quartz used in countertops and other indoor surfaces. Shares of Caesarstone are down more than 50% from their multi-year high, creating a solid value in an otherwise expensive market. The U.S. is Caesarstone's most important market, but U.S. sales have been declining in recent quarters. During the fourth quarter, revenue from the U.S. dropped 2.8%, even as smaller growth markets like Canada and Australia posted impressive growth. The good news is that this weakness appears to be temporary. The company is working through some issues at its U.S. manufacturing facility, which opened in 2015, and it has made changes to its sales organization. Caesarstone expects the U.S. to be one of its strongest regions in 2017, driving revenue growth for the company. The long-term growth potential is substantial, with engineered quartz accounting for less than 10% of countertop sales in the U.S compared to nearly 40% in Australia and nearly 20% in Canada. Caesarstone produced $2.15 in earnings per share (EPS) last year, putting the stock price at about 16 times earnings. For a small company with plenty of room to grow, Caesarstone looks like a solid deal to me. Daniel Miller (AutoZone): One company higher than Kinder Morgan on my list of potential investments is AutoZone, a premier seller of aftermarket automotive parts, tools and accessories to do-it-yourself (DIY) consumers. It's higher on my list for the following reasons: It's trading at a cheap valuation, it's performed consistently over the long haul, and it has room for growth. First, let's take a look at its performance over the long haul. 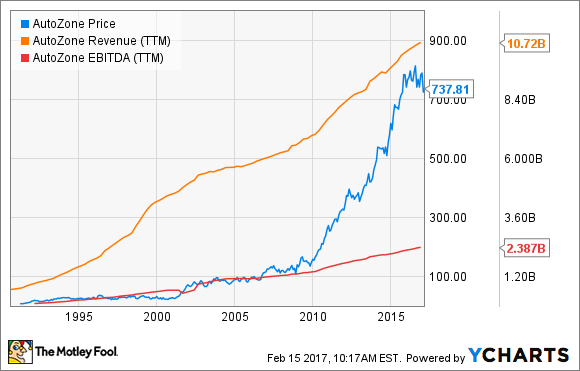 AutoZone generated net sales of $10.6 billion during 2016 with earnings before interest, taxes, depreciation, and amortization (EBITDA) of $2.4 billion, and it's net sales have historically been solid with a 10-year compound annual growth rate of 6%. But what's even more reassuring for investors is that, on the chart above, you'll notice there wasn't much of a hiccup during the great recession. That's because during the massive slowdown, more consumers opted to fix small vehicle issues themselves, supporting AutoZone's sales growth. That's one perk of owning AutoZone, but here's another: As the company focuses on a new segment, do-it-for-me consumers, it has plenty of room to grow its top line in the years ahead. Historically, AutoZone hasn't participated in this segment much, preferring to stick to do-it-yourself customers. That's changing, and it's estimated to be a $67 billion industry, of which AutoZone only has a 2.9% market share. AutoZone plans on adding service bays to more of its stores to take advantage of this market, and it remains a strong catalyst for its business. Lastly, per Morningstar.com forward estimates, AutoZone is trading at a forward price-to-earnings of only 14. That's cheap for a consistent company that performs well during recessions and has room for growth.